You will see and feel the difference! Softwashing is a process consisting of applying a cleaning solution, letting the solution dwell giving it time to do the hard work, and then rinsing the grime away. 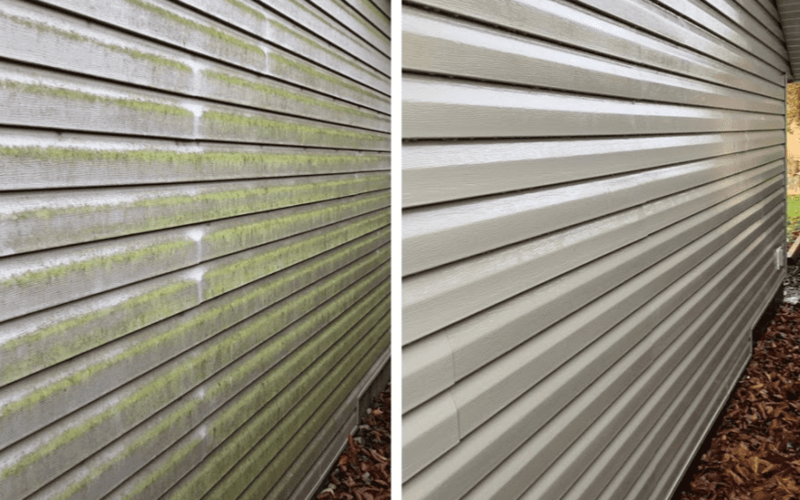 Lichen, moss, mold, mildew, algae, road grime and dirt don’t stand a chance against soft washing and low pressure washing. Softwashing is very effective for roofs, siding, signs, and various types of exteriors that can’t handle high pressure methods. With nearly 30 years of experience behind us, you can be sure that you will be getting top results that last. Click Below for a free quote, or call us for a free on-site estimate. Either way, you can rest assured that we will provide you and your cleaning project the most professional and highest quality results, ever. With more than 25 years of experience in the industry, We pride ourselves on our proven track record as a trusted home service provider. Our clients trust us enough to give us access to their residence, even if nobody is present on the premises. We have never betrayed this confidence. When we make an appointment, we show up for it – on time and ready to go. And if for some reason, we can’t make it – for example, due to bad weather – we will notify you in advance. You can count on us. You get what you pay for. If you’re simply looking for the lowest price, we’re not for you. If it’s quality that you’re after, then look no further. ClearView offers you the best cleaning experience at a reasonable and competitive price. Our #1 priority is your complete satisfaction. From your first experience with us until the job is done, our goal is to provide you with the respect you deserve. We are a customer service business that just happens to clean windows!